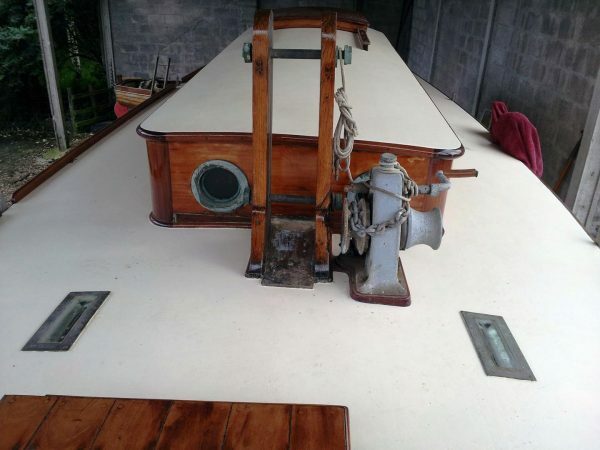 ….. SOLD – December 2013 …..
Naida was one of a number of yachts built during the 1930’s to Dr. T Harrison Butler’s ‘Askadil’ design, a proven long distance cruising yacht with sisterships having sailed thousands of sea miles including Atlantic crossings. Little is know of Naida early history although she has been recognised and authenticated by the Harrison Butler Association and the late President, O Joan Jardine Brown. 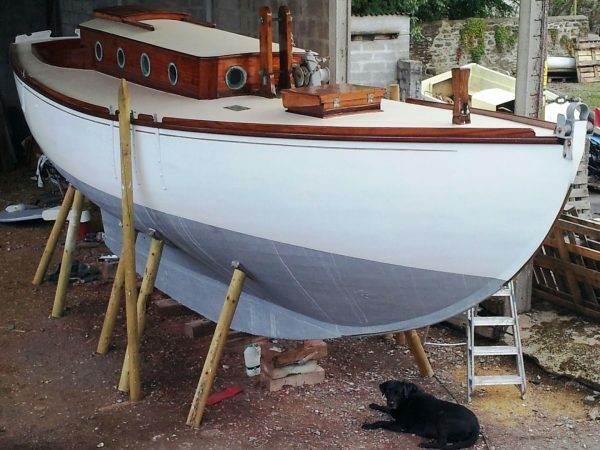 Naida was built by Norfolk boat-builder Kenneth Ernest Newton in Cley Next Sea just before the Second World War for a local farmer. 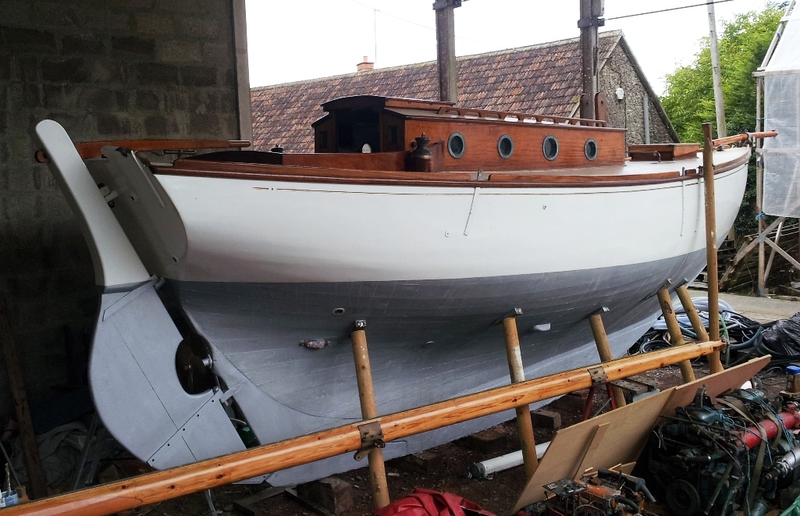 Newton was well known as a motor and sailing yacht builder and for the Uffa Fox designed Blakney One Design. During the early 1950’s Naida was owned by R R Allison of Canterbury and moored in Dover Harbour. 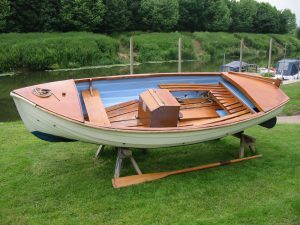 In the late 1950’s she was sold to Hugh Kennard of Court Lodge, Maidstone. In the mid 1960’s P A Main of Kingsdown, Deal acquired the vessel. 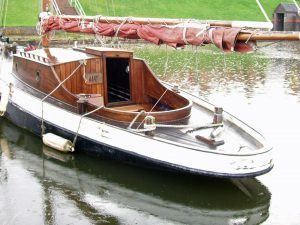 In 1970 Naida was sold to Michael Constable of London and left Dover for a mooring in Chichester Harbour. 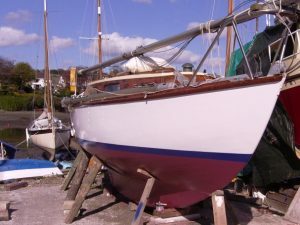 In 1975 Major Terry of West Poynings, Devon bought Naida first keeping her in Gosport and during the 1980’s in Woolverstone. 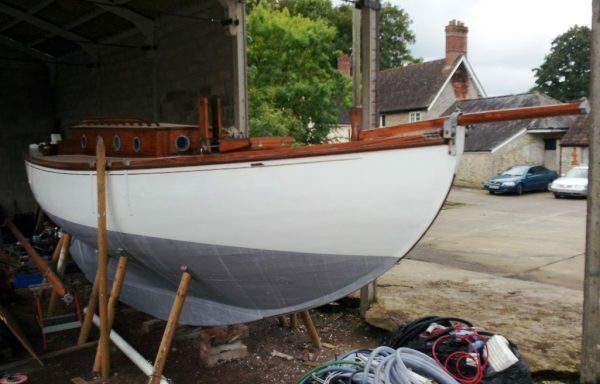 During the 1990’s the yacht was laid-up for repairs and has remained in dry storage since, Considerable work was carried out by Lathams boat builders in Poole. 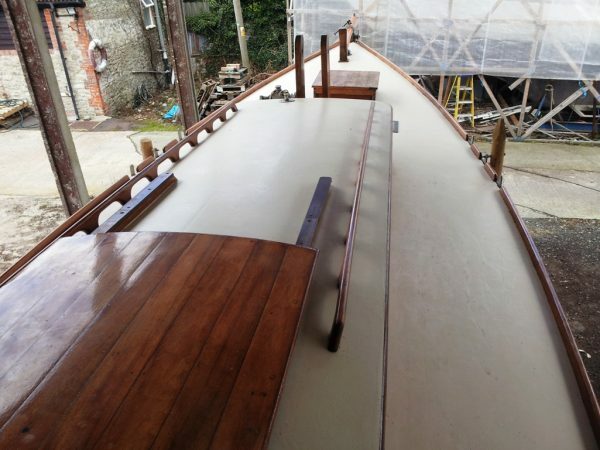 Work carried out to date has included stripping and repairing the cabin roof and all deck areas then the whole was covered and sealed with fibre-glass. 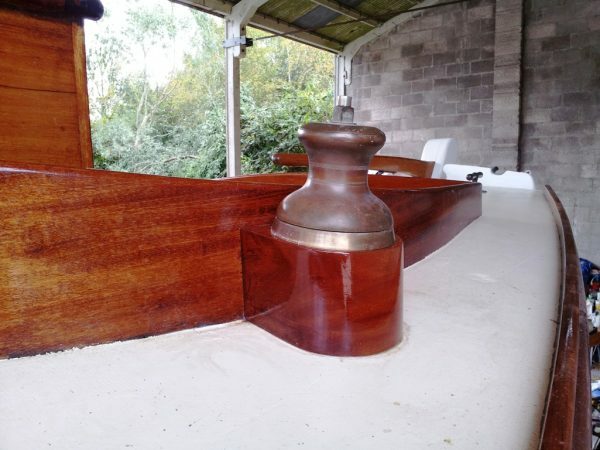 New rubbing strakes, new toe rails, completely re-built cockpit with new curved coamings. New mahogany winch islands, new stainless steel fuel tank with new fuel line and fuel filter. 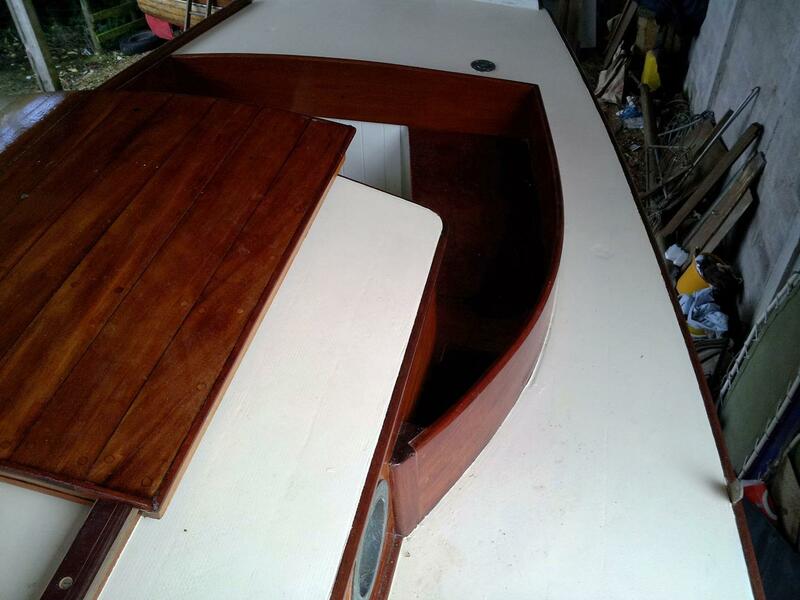 New rudder fastenings, new teak cabin top handrails, mast re-built and new lower section added. New galvanised chain plates, new forepeak sole, new saloon upholstery, new self-draining cockpit sole with new hoses and through hull fittings. Full interior re-paint. Gally re-fitted. 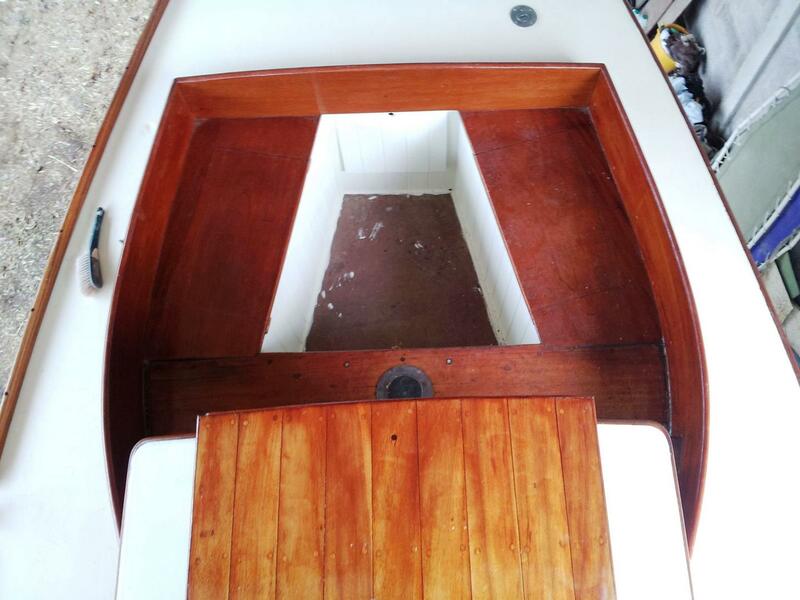 Underwater hull payed with hemp and sealed with red lead putty. Iron keel sand blasted and re-painted. All exterior surfaces of the vessel taken back to bare wood and re-painted or varnished. 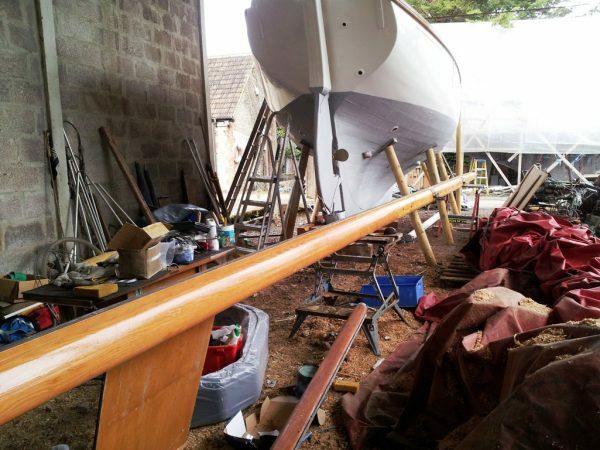 Carvel pitch-pine hull copper fastened to steam bent timbers. 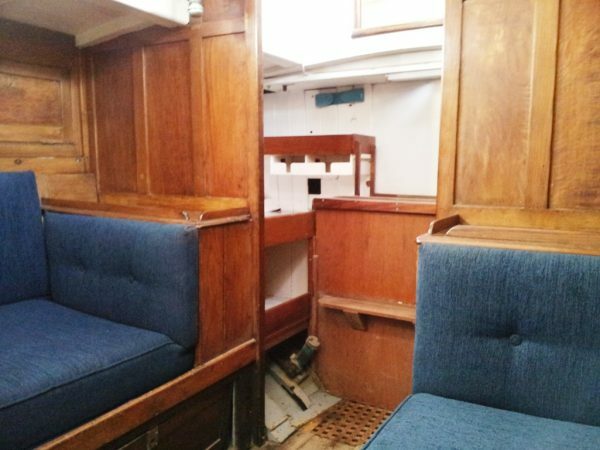 Oak centre-line, sheathed decks, teak cabin coamings and deep HB style cockpit. 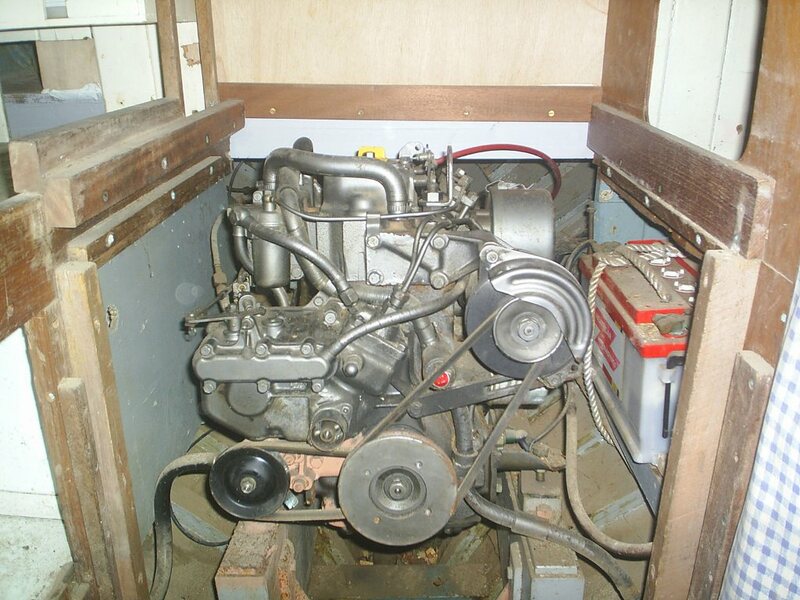 Yanmar 2Qm15 twin cylinder 15 hp diesel engine, raw water cooled with a Kanzaaki gearbox driving a 3 bladed propeller. 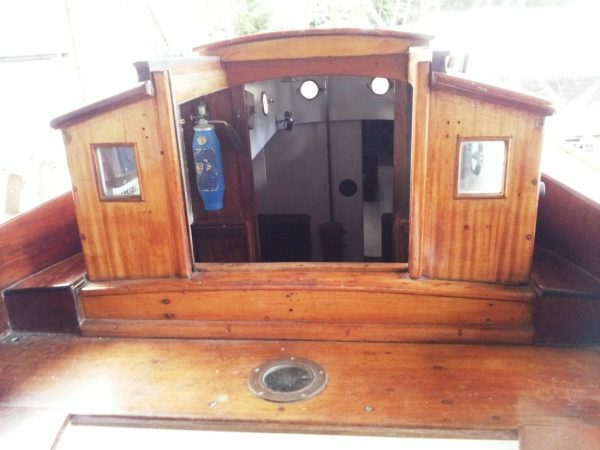 Cutter rigged with a deck-stepped mast mounted in a wooden tabernacle. Timber mast, bowsprit and boom. Two bronze winches mounted on the mast. Stainless rigging with running back stays and levers, twin back stays. 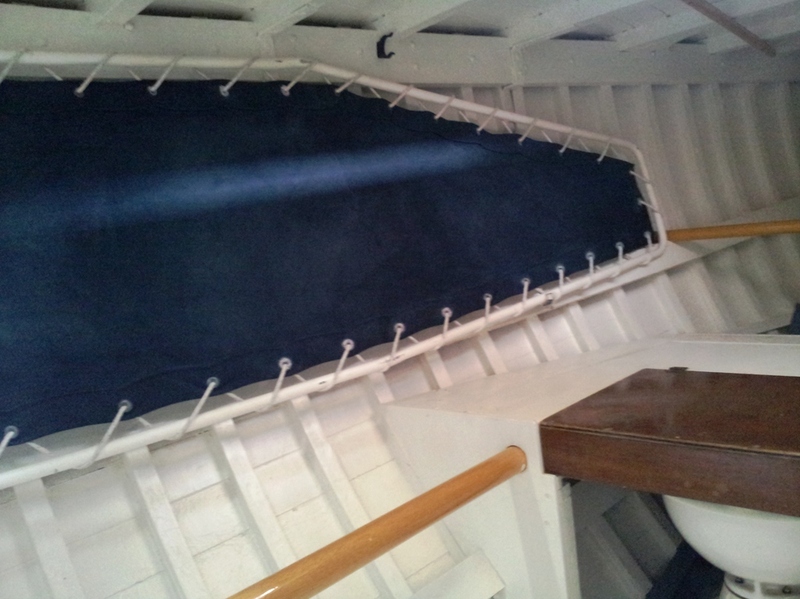 Main sail and two head sails. 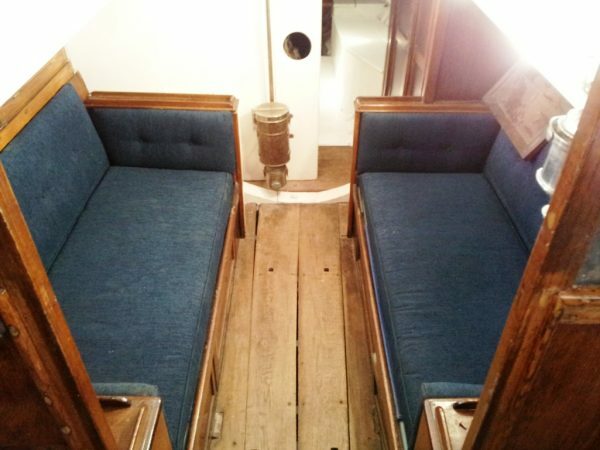 The accommodation which has the original oak panelled interior is arranged in two cabins comprising two settee berths in the main cabin, and two cot type fold away berths in the forward cabin. 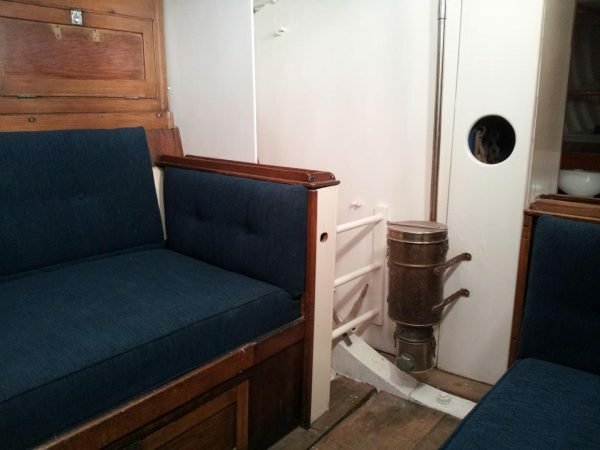 Main cabin has a Pascall Atkey stainless steel charcoal heater. There are two gimballed bulk head oil lamps. A recent Lavac sea toilet is installed in the forward cabin mid ships. 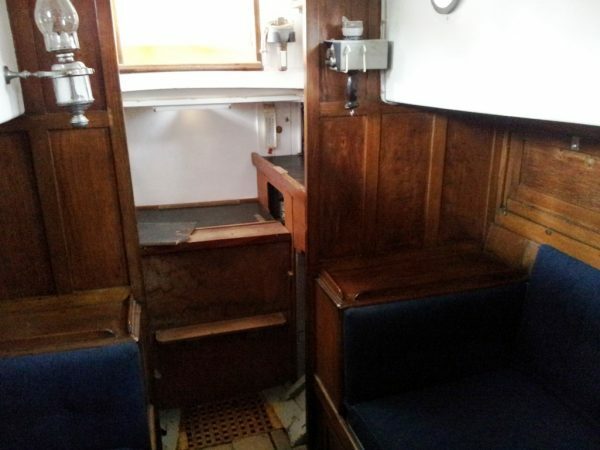 The galley is situated to either side of the companionway with a sink to port and a cooker to starboard. The stainless steel sink is supplied with cold water via a manual pump. Kelvin Hughes Husun 65 VHF radio. 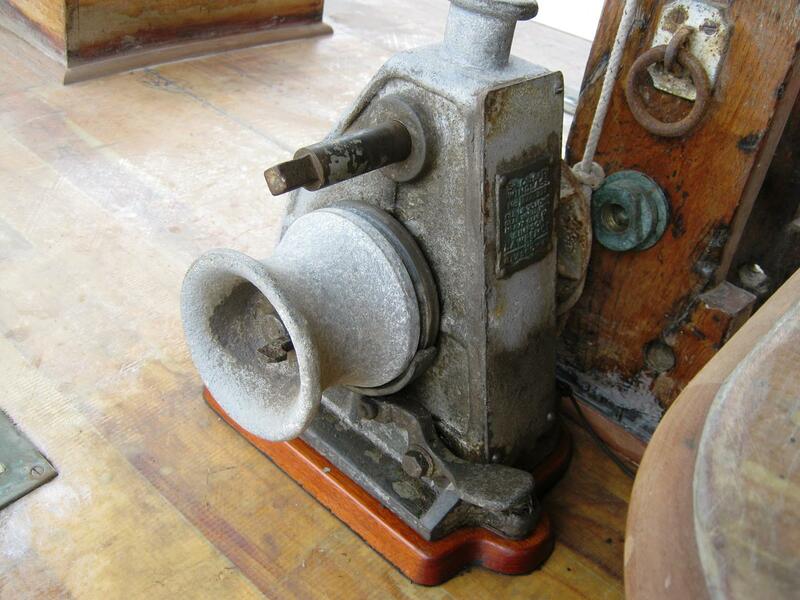 Period gimballed Sestral main compass. New automatic bilge pump and float switch. 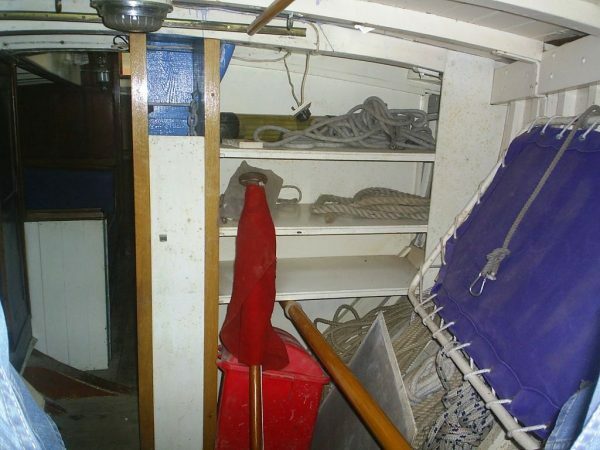 A rare opportunity to acquire one of the desirable larger yachts by the Metacentroid designer THB. 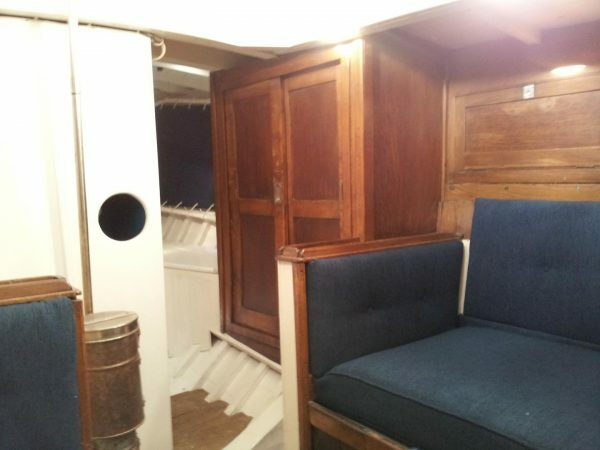 Naida has a remarkably original interior and recent boat-yard work and total re-fit makes this a very desirable vessel. 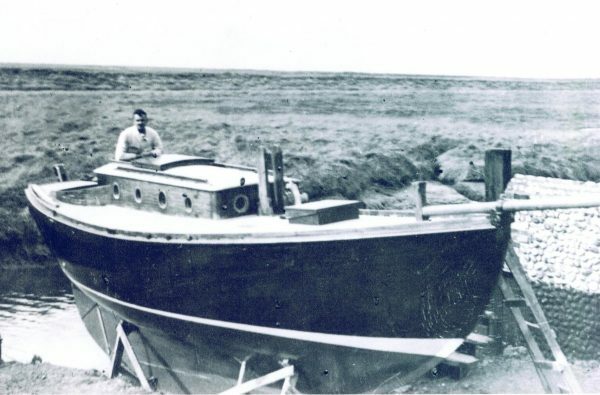 Black & White image of the builder Kenneth Newton aboard just prior to launching in 1939.